A long, long time ago, in what sometimes seems like a different world, I sat down, full of passion, to write the book that eventually became ‘Killer of Men.’ And today, in a coffee shop, I sat down to write the last lines in what will probably be the last book of the Long War series. Six books. About a million words, and almost ten years. It was the most exciting intellectual journey of my life. It involved more original research than I ever expected to do to write historical fiction. It changed my philosophy of reenacting; reconstructed my view of the world, altered my own take on philosophy profoundly, and allowed me to drain away some PTSD. Oh, and I took up a new martial art. So I hope you will all understand that it took a major effort not to weep as I wrote the last lines. I have spent a lot of time inside the head of my Killer of Men. And I’ve spent an enormous amount of time trying to recreate elements of his world, from the philosophy of Heraclitus to the proper construction of Archaic Greek armor and shields. I learned, or relearned, the difference between reading and research; reading is where you can follow a good path that other scholars have worn for you, moving from tome to tome and taking what you need as a write of Historical Fiction. I’m not ashamed to say that’s what I did with Kineas and Alexander; the heavy lifting was done. I just read the sources and then the secondary works. And then I discovered the late Archaic. There’s one source: Herodotus. There are other sources who may be valid; Cornelius Nepos, Plutarch, Diodorus Siculus, Thucydides, Pausanias. He invented modern history. And he wrote the first history in the west; the first attempt, I would argue, to give an unbiased account of the world around him and how it came into being. Herodotus believed in many things we don’t believe, including omens and prophecy, but he also had a sharp scalpel when cutting away crap. One of my favorite factoids about Herodotus is that Plutarch thought he was ‘too fond of barbarians’. In fact, if Plutarch had known the term ‘revisionist’ he’d have applied it to Herodotus. Isn’t that interesting? the first historian in the west was highly critical of the ‘heroes’ of his generation and the generation before him. Here are two random problems encountered in my first day writing..
What did Archaic Greeks wear? How did they light a fire? Surprise! It’s ten years later. I think that my friend Giannis Kadaglou and I know as much as there is to be known about Archaic Greek costume, and we still can’t fully agree as to how an upper class man of 500 BCE was dressed. And I still don’t know exactly how a 500 BCE housewife, or priestess, or servant or slave lit a fire. My friend Nicolas Cioran calls it ‘the journey into complete darkness.’ It’s an excellent phrase. 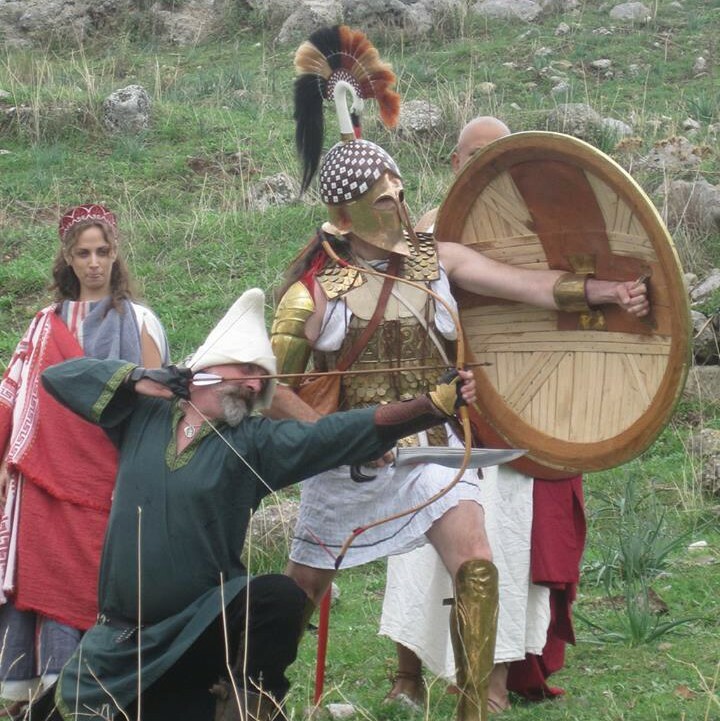 So… to help me learn, I thought I’d join an ancient Greek reenactment group. Side note. In 2007, when I entered on this journey, I ran a group that did a British unit in the American Revolution; we had about sixty members, and we were part of a larger organization with perhaps five thousand members. It seemed a simple matter to find some expert Greek living history group, and join them. I’d learn a ton, find out who Greeks started a fire, and move on. By 2008, I’d discovered that, not only were there no Ancient Greek living history organizations in North America, but also, that no one planned to reenact the Battle of Marathon in 2011, when it would have it’s 2500th anniversary. By which I mean I found a lot of like minded people; there WAS an expert Greek reenactment group, in England, called the ‘Hoplite Association’ and there was this guy in Greece… who was young enough to be my son… and seemed to know a great deal; there were a lot of really good reenactors in Australia, and in France and Spain…I met Giannis for the first time in 2009 and he slept on the couch in our apartment in Athens and after three days, my daughter thought he was the coolest person in the world and my wife and I pretty much felt the same. He became an instant best friend. And at the same time, my original best friend, Jevon Garrett, got cancer. Going to Marathon and Greek reenacting developed an edge, because Jevon was going come hell of high water, even if it was the last thing he did. So we had a reenactment of the Battle of Marathon. There were fewer than a hundred of us, and the quality of kit ran a huge gamut from not very good to really very good. And at the end of the event, I knew a heck of a lot more than I’d known at the beginning; about living as a hoplite, and about herding cats… And, remarkably, I learned that I could, in fact, actually get people to travel five thousand miles to reenact something. Even the air freight and use of pallets to ship our aspides (Ancient Greek pl. or aspis, the hoplite shield — no link to the Wikipedia article because it’s lame ) was a useful learning experience. For something. Side note? Jevon did not die. Still with us, in fact, and just reenacted Marathon again in 2015. By the time the dust settled on Marathon 2011, I’d written two of the Long War books and I owned about fifteen thousand dollars worth of books. And yes, there are libraries, and no, most of them don’t actually have the books I need. Most serious research on Archaic Greece is in Greek or German. By the way, there will be a separate blog JUST on the Battle of Plataea, because for that, I did actual research; that is, original work coming to different conclusions from others in the field. All of whom are now my friends. Many of whom were in the phalanx at Marathon 2015. And of course we looked at Salamis. And then I went home and wrote the book. And then, four times, Plataea. More friends, more fun, another tour, and we walked the ancient site and the battlefield, which is, I can tell you, about the size of Gettysburg or Waterloo. No signs, no signposts. Not even a marker. Just our two expert guides, and two slightly less expert guides (the latter are Giannis and I) and a lot of walking, and a bus. And in the end, I wrote a book about one of the great battles in history, and about having friends. I am lucky, amazingly lucky, to have so many friends, and when I found out that one was very sick, I tried to finish the ‘Rage of Ares’ as quickly as possible. Just in case. And.. I left the door open. Just in case you’d all like to hear one more story about Arimnestos of Plataea, who was, in case you haven’t noticed, a real man. He’s in Herodotus. And Pausanias too. Because really, I don’t want to say goodbye. I’ve learned so much… there’s so much more to learn, and so many more friends to make. And at the very least, I hope that in 2021, we’ll all be at Plataea, reenacting. Good work, Christian! And a terrific farewell to Arimnestos here, as well. Very much looking forward to reading it when it commercially comes into being, but I’m glad to know from you directly that it now exists and was consequential in your life. Thanks again! Christian G. Cameron. Congratulations. You are brilliant and a huge inspiration. This is a grand accomplishment. Thank you for sharing your work and personal story for “how it is done”. Oh, that you for this. Your commitment to these projects – to these people – is impressive. Reading the books was made more enjoyable by following your own journey throughout these years. For what it’s worth, the groundwork, research and soul you put into your books shine through. The Long War books are incomparable with any fiction based in that period. I can’t wait for the latest (not last….) book. An amazing amount of dedication and, let it be said, love. Good luck and a fair wind to Rage of Ares. I have been most fortunate to travel in the footsteps of Arimnestos of Plataea with you. Experience of a lifetine. My Fav Author, talking about one of my Fav series…. the end is nigh… but what an ending it will be. Congratulations! It must be quite a feeling to finish such a work and leave these characters behind for now. Your passion for the periods and people you write about shines off of every page. There are so many good writers but your books are not just good, they are great. They make the color in other stories seem a bit flat. Your books inspired me to look into Fiore (I was solely a German tradition man) and to read De Charny and Llull. And then there are Tom Swan and the Red Knight… And now I’ll have to read the Long War all the way through again! Thank you for writing your awesome books and for letting me be at Marathon, Crécy or Belgrade even though I was born centuries later. I’ve only just started with your books, but really enjoyed what I’ve read. Always a good feeling to finish a story and very interesting to hear how you approached the research. I hope we can all prevail upon you to keep writing about ancient Greece. You write on it masterfully and the field of ancient Greek historical fiction is basically you and the late David Gemmel. While you practically trip over novels set in ancient Rome these days. I will never stop writing about Ancient Greece. So good to hear, love your books immensely. Literally just finished reading the chivalry series for the third time and I’m sure it won’t be the last. Was just talking about your books to my brother and I said I didn’t know any other author who brought the world the wrote about alive so authentically like you do. Hope there’s another William Gold adventure waiting in the wings! The next William Gold is on p. 500 and should be done in a week or so. Thanks!